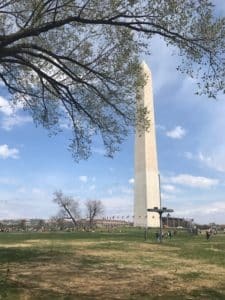 (April 7, 2019) You can depart the Flag House inn and be at the National Mall in Washington DC in 60 minutes. With low risk of getting lost or costing a fortune. Ahead of time, figure out where you are going. 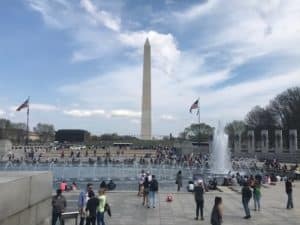 If you’re going to the Mall, get off at Smithsonian, it will be about 25 minutes on the Metro, head up the escalator! Enjoy all of the Mall, head back and reverse course. It’s easy to get back on US 50, just turn right out of the parking lot/garage on to same road, stay to the left and you are right back on US 50 headed to Annapolis! 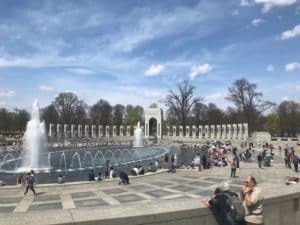 Here are some pictures from our own trip today, we met up with our daughter who lives in the DC area, we had a lovely afternoon looking at the cherry blossoms, checking out the World War II memorial and walking the Mall. The only negative was the loooonnnggg time it took to get something to eat from the food trucks. 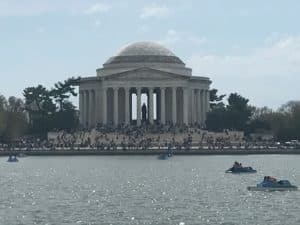 There are other options such as cafeterias at the museums or in downtown DC near the Verizon center. We’ve got some recommendations…. 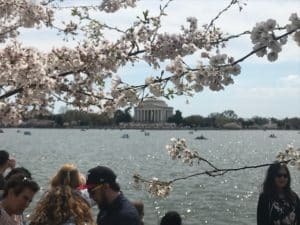 So, if you are on a longer stay, use the Flag House Inn as your base of operations to explore the area, including Baltimore or the Eastern Shore. 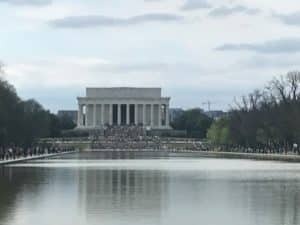 We are natives, having lived in DC, Baltimore and we’re very familiar with the Eastern Shore too! 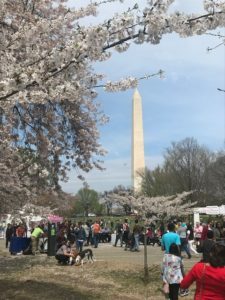 This entry was posted in Happenings in Annapolis, Things to Do and tagged Annapolis to Washington DC, Cherry Blossoms, Washington DC by client-admin. Bookmark the permalink.